From a practical point of view and in an effort to avoid the sanctions under the Bill, it is advisable that employers should include the foregoing information in any offer letter being issued to a new employee. A contract of employment can then be issued inside the 8-week period as provided for in the Terms of Employment (Information) Act 1994. In the Bill’s current format, where an employer is convicted for failure to comply with the foregoing, they may be liable on summary conviction to a Class A (ie up to €5,000) fine and or a term of imprisonment not exceeding 12 months. The above is of concern to employers and is expected to have a detrimental effect on businesses. In reality, it is widely expected that this new provision will force employers to close during quieter periods so as to avoid employees gaining rights under this provision. The concern is that if employees gain the right to move up in the bands then the employer may not be in a financial position to meet the increased wages over the longer term. The Bill is silent on the reduction of hours when the hours are not available at a later date. The Employment (Miscellaneous Provisions) Bill 2017 imposes an obligation on employers to offer additional hours that may become available to existing part-time staff. The provision in its current format essentially prevents an employer from offering such additional work to full-time individuals. This measure clearly has an overly burdensome effect on how an employer can run their business. The provision is wide and fails to address issues such as skills and training and puts unreasonable expectation on employers to provide such additional hours to staff that simply may not be trained or qualified to carry out such work. Furthermore, it is likely that the provision will have a serious impact on custom and practice within organisations. For example, in situations where it is customary that overtime is regularly worked by full-time staff, it will not be within the gift of an employer to allow full-time staff to continue in this form. It will be set out in legislation that any such available hours will have to be provided to part-time workers where there are part-time workers employed. The Employment (Miscellaneous Provisions) Bill 2017 imposes a strict prohibition on zero-hour contracts. If passed zero-hour contracts will only be allowed in circumstances which are genuinely casual in nature and in emergency cover situations. Again, the restriction is overly restrictive and may well result in employers not being able to fill casual or part-time roles for fear of falling foul of the proposed legislation. 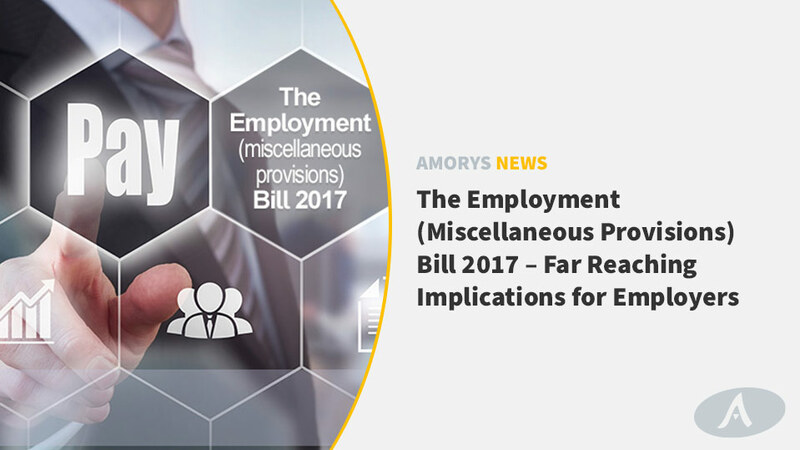 It is clear from the foregoing that if passed the Employment (Miscellaneous Provisions) Bill 2017 will have far-reaching implications for employers. Given the overly onerous provisions in the Bill, it is regrettable that there does not appear to have been prior consultation with employers. In the circumstances, you may consider it appropriate to raise the issue with your elected representatives. If you would like further information in relation to the above please contact Brian Kirwan at brian@amoryssolicitors.com, or telephone: 01 213 59 40 or your usual contact at Amorys.